What were the landing marks? 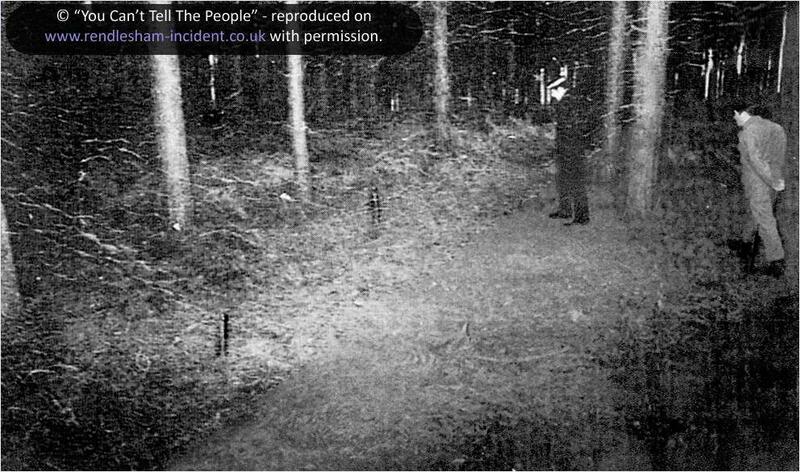 Following the first sighting of a flashing UFO in Rendlesham Forest, a triangle of small indentations was located between the trees near the eastern edge of the forest, and was attributed to the UFO. Evidence is presented that these depressions did not form a symmetrical triangle and were indistinguishable from rabbit diggings. 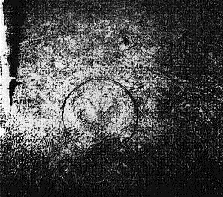 As a close second to the radiation readings, the most celebrated physical traces at the Rendlesham Forest UFO landing site were the supposed landing marks, consisting of a triangle of indentations in the forest floor. Both Vince Thurkettle, a local forester, and the local police who saw them were convinced these were nothing more than rabbit diggings, and not new ones either. A trip to Rendlesham or any similar forest will turn up endless examples of such marks. The question inevitably arises: how can anyone distinguish between indentations made by an animal and those made by a landed UFO? In his memo to the UK’s Ministry of Defence, Col. Halt said: “Three depressions 1.5 inches deep and 7 inches in diameter were found where the object had been sighted on the ground.” It is not clear how the airmen knew exactly where the object had been on the ground. Apparently they did not mark the site at the time but went back later to look for signs of a disturbance that could be attributable to the supposed craft. There are conflicting reports about who found the landing site, but John Burroughs told me by email on 2008 January 17 that he thinks it was Captain Mike Verrano and Master Sergeant Ray Gulyas. Gulyas took this photograph (left), unearthed by researcher Georgina Bruni, which shows PC Brian Cresswell examining a triangle of marks with Capt. Verrano on the morning of 1980 December 26. Each of the marks was identified with a stick – click on the picture for an enlargement. Daylight visible between the background trees confirms that this site was indeed near the forest edge. Plaster casts were taken by Penniston of the impressions and have occasionally been displayed at UFO conventions and on TV. Close-ups of individual marks are shown on other photographs taken by Gulyas that same morning and obtained by Georgina Bruni. These were forwarded by Lord Hill-Norton in 2001 to the Ministry of Defence, which released them publicly in 2007 under the Freedom of Information Act; two examples are shown below. They appear to be nothing more than shallow disturbances in the layer of pine needles that carpets the forest floor. The small sticks next to them were pushed into the ground by USAF personnel as position markers. Vince Thurkettle has confirmed to me that he believes these pictures are of the same landing site he was shown, at the eastern edge of the forest. Halt has taken TV crews to this same area. Incidentally, some witnesses have described seeing imprints that looked like they were made by a catering-sized coffee can. It is possible that these were made by the airmen to indicate the position of the landing site, but were later mistaken by others as the ‘real’ marks. Photographs of two of the so-called landing marks in the forest floor. Each has a stick next to it placed by the airmen who found them. Click on a picture for an enlargement. Similar marks dug by animals can be widely seen on the forest floor. It is sometimes said that the ground was ‘frozen solid’, but this is sandy soil overlain with pine needles and does not freeze. This spontaneous comment reveals his disappointment. Evidently his rather garbled second sentence is a concatenation of the reactions “Is that all?” and “Aren’t they any bigger than that?” Indeed, from the dimensions he gives in his memo they are about the size of a hand and the depth of a thumb – suspiciously similar in size to rabbit diggings, and surely too small for the presumed landing gear of an object described by some witnesses as being “as big as a tank”. 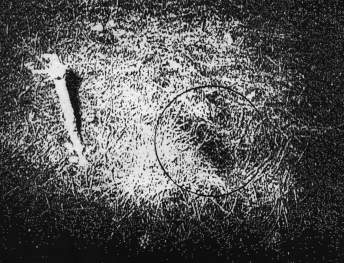 In a talk to a UFO group called Quest International at Leeds, England, in July 1994, Col Halt said that the marks looked as though they were made by legs sticking out at an angle. He might have added that burrowing animals dig in at an angle, too. Vince Thurkettle was shown the site in early February 1981, about 6 weeks after the supposed landing. Click here for a TV interview in which he explains his reactions on seeing the marks and how he knew what they were. have redrawn his sketch at left for clarity. A number of comments are necessary. Firstly, Vince used a mixture of units on his sketch – the size of the indentations is given in inches but the separation between them is written as two and a half metres. (This matches the dimensions of the triangular object reported in Halt’s memo, which was said to be “two to three metres across the base”.) No units are given for the depth, simply written as ‘1–2’, but presumably Vince means inches here also. On his original sketch the distance between the two left-hand indentations is slightly greater than that of the other two sides of the triangle, which accords with his statement to me many years ago that the three marks did not form a symmetrical triangle. It is sometimes claimed that Vince was not shown the ‘real’ landing marks but a different set some distance away. This is an easy way of dismissing awkward evidence, but in turn raises the question: how many similar sets of marks were there in that forest? Either way, one is left wondering what sort of advanced craft totters around the Galaxy on a tripod with small, splayed feet like those described by Col Halt. ...and what about the tree damage? 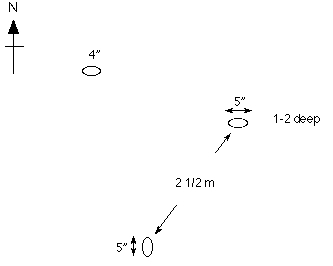 A related aspect concerns supposed tree damage above the landing site. Jenny Randles has laid great emphasis on this and, on page 183 of her book UFO Crash Landing, she claims it is one of the “vital clues” to the case. So much for ‘evidence’ which, Jenny says in her book, “has never been successfully tackled by any of the skeptics”.